The Easypet 3 was designed with the latest technological developments and now, pipetting speed is controlled simply with the tips of your fingers allowing you to experience more sensitive control of the meniscus. 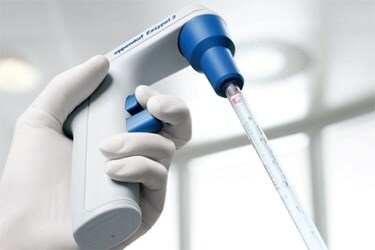 The powerful motor delivers efficient performance to speed up large volume pipetting while also providing the utmost control for smaller volumes. The Easypet 3 has an excellent speed adjustment that allows for an optimized gravity drain option that can be used for easy dispensing of liquid without splashing. Weighing only 160 grams, the lightweight, well-balanced Easypet 3 has been designed considering all ergonomic findings to sit comfortably in your hand, matching its shape to allow for fatigue-free pipetting. Easypet 3 can be used with all types of serological and volumetric pipets from volumes of 0.1–100 mL.